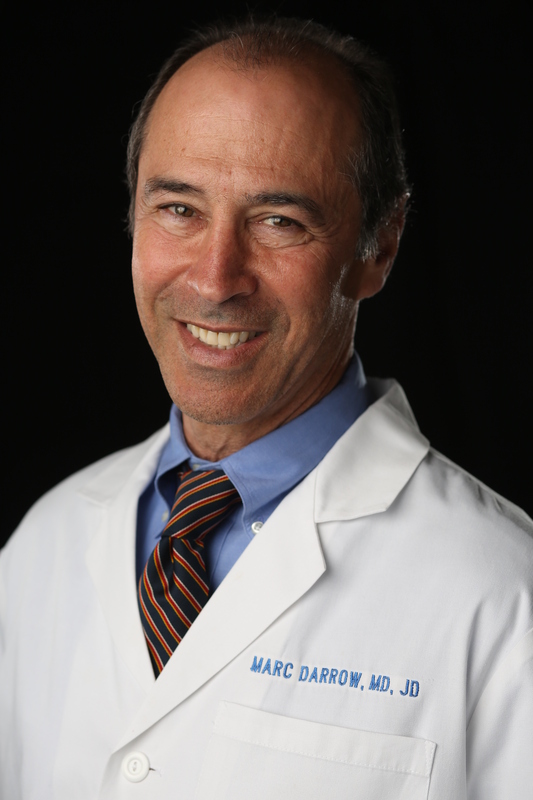 Dr. Marc Darrow is a Board Certified Physiatrist specializing in Physical Medicine and Rehabilitation. An avid sports enthusiast, Dr. Darrow injected himself, and was healed by Regenerative Medicine after an injury on the golf course caused him to suffer the kind of chronic pain that afflicts millions of Americans. In 1998, Dr. Darrow became a believer in the therapeutic healing power of Regenerative Medicine after only one treatment to his wrist. He has used this therapy on many of his injured body parts. Since then he has devoted his practice to Stem Cells, PRP, and Prolotherapy, which are natural therapies that have revolutionized the way we heal pain. Dr. Darrow has treated thousands of patients. Many of these patients were scheduled for surgery and never needed it. And, several patients came to Dr. Darrow after a failed surgery and were healed. Dr. Darrow graduated from Northwestern University and has a Medical degree from the University of Hawaii. He completed his Physical Medicine and Rehabilitation Residency at UCLA School Of Medicine. After college, Dr. Darrow completed a Doctorate in Jurisprudence from Golden Gate University College of Law in San Francisco, as well as a Masters of Business Taxation from the University of Southern California and practiced law for 15 years prior to his medical career. “Even before medical school, I watched surgical procedures as much as possible. I wanted to become a surgeon since I wanted to heal. In medical school, I did surgical research and assisted in the operating room more than my classmates. There was nothing better than a quick fix. Cut the skin, open up the body, fix the problem, and suture it back up. By the time I had finished medical school and internship (where I spent as much time as possible doing orthopedic procedures) I had seen too many surgical failures. I even saw a woman die on the table during a hip replacement. A year after a painful shoulder injury while weight-lifting, I decided to have my orthopedic professor operate on me. It was a “simple” arthoscopic surgery. It did not go simply. My arm blew up like a balloon with fluid, and I had a fever. We thought it was an infection. It took a year after my surgery to heal. But it was no better than before the surgery. I later learned about prolotherapy, injected my own shoulder, and the pain was gone the next day. I never needed the surgery. Later I found out that most patients do not need their elective orthopedic surgeries. In my clinic, I have many new patients who are ready for surgery, and come in for a second opinion. It is rare that I agree that surgery is the correct option. It can always be used as a last option after more conservative measures are used. The best healing technique I know of in musculoskeletal medicine is Prolotherapy. After the healing of my shoulder and wrist with Prolotherapy, I began using it on my patients. Since this initial discovery of Prolotherarpy, Dr. Darrow has become a leading expert and teacher of Stem Cell Therapy, Platelet Rich Plasma therapy, and Prolotherapy. As an adjunct to health, Dr. Darrow’s wife, Michelle Darrow, is a Nurse Practitioner, who teaches the Ideal Protein weight loss program. In addition, she performs cosmetic procedures with Botox and Dermal fillers such as Juvederm, and is certified in the Vampire Face Lift (a cosmetic procedure of injecting Platelets) that Kim Kardashian made famous. Board Certified, Physical Medicine and Rehabilitation. Rhone-Poulenc Rorer Physical Medicine & Rehabilitation Scholarship. Pan-Pacific Surgical Association Award for Outstanding Achievement in the Field of Research. Medical Research Award for Outstanding Achievement In the Field of Research. Darrow M, Foulkes G, Ayoub M. “Zoonotic Transmission of Turtle-Borne Edwardsiella tarda.” Infect Med 10(4): 33-359 1993. Leckie R, Darrow M, Delaplain C. “Salmonella Osteomyelitis in an HLA-B27 Patient.” PMID: 8482035 [PubMed – indexed for MEDLINE] Clin Nuc Med 18(4): 346-347, 1993. Leckie R, Deloplain C, Watabe J, Darrow M. “Thyroid Hemagenesis by Iodine-123 Thyroid Scan With High Resolution Real Time Ultrasound Confirmation.” PMID: 8432068 [PubMed – indexed for MEDLINE] Clin Nuc Med 18(2), 1993. Darrow M, Foulkes G, Richmann P, De Los Reyes C, Ayoub M. “Atypcal infections of the Hand: 2 Cases.” PMID: 8776082 [PubMed – indexed for MEDLINE] Am J Orthopaedics. December,1995, 914-7. Darrow M, Brammer WK, Rowley A. Thyrotoxic Periodic Paralysis. PMID: 7605191 [PubMed – indexed for MEDLINE] Arch Phys Med Rehab. Vol 76, July 1995. Darrow M, Reynolds JC, Robbins J, Ain KB, et seq. False-Positive Identification of Thyroid Cancer Metastasis Using Iodine-131. Awaiting clearance at National Institute of Health. Darrow M The Knee Source Book. McGraw Hill. Alternative Medicine, the Definitive Guide, Publisher: The Burton Goldberg Group. Chapter: Prolotherapy, co-author. “Shoulder Strain: Prolotherapy is an effective, nonsurgical option for wheelchair users with chronic shoulder pain.” Advance for Directors in Rehabilitation February 2004, Vol. 13, No. 2, p. 49-52. “Waves of Healing: Therapeutic ultrasound is a versatile tool with a range of uses.” Advance for Directors in Rehabilitation March 2003, Vol. 12, No. 3, p. 61-62. Prolotherapy Injections for Pain Management.Monthly workshop for UCLA-VA PM&R Residents. Back Pain: Non-Surgical Management. St. John’s Hospital and Century City Hospital, CME. Shoulder Pain & Imaging Methods. UCLA-VA PM&R Residents. Neurogenic Bladder and Spinal Cord Injury. UCLA-VA PM&R Residents. Physical Medicine Modalities. UCLA-VA PM&R Residents. Darrow M, Foulkes G, Ayoub M. “Zoonotic Transmission of Turtle-Borne Edwardsiella tarda.” Infect Med 10 (4): 33-359 1993. Presented as Visiting Faculty at Musculoskeletal Infection Society Annual Scientific Meeting, Snowmass, Colorado. Presented at American College of Physicians Science Meeting, Honolulu. Presented at University of Hawaii Biomedical Sciences Symposium. Darrow M, Gordon L. “Clinical Study on Low Back Pain Before & After Fusion & Wiltse Internal Stabilization.” Presented at 7th Annual Combined Orthopaedic Symposium. Presented at University of Hawaii Medical School Biomedical Sciences Symposium.